(noun \ˈhwȯr(-ə)l, ˈwȯr(-ə)l, ˈ(h)wər(-ə)l\) something that whirls, coils, or spirals or whose form suggests such movement. This small art quilt started as an exploration of texture. As many of my pieces, it was prompted by a monthly challenge from my Art Quilt Group. I first hand-dyed a length of fine china silk, then started tucking and gathering with matching thread. I didn’t have any plan for the final outcome; it evolved organically into the nautilus shape. The silk was backed by a double layer of cotton batting, then embellished with glass beads and my favorite variegated silk embroidery floss. Finally, I finished the edges in the naturally irregular shape it had become, and mounted it on a crisp-cornered pillowcase-finished eggplant Kona cotton base. Bonus! 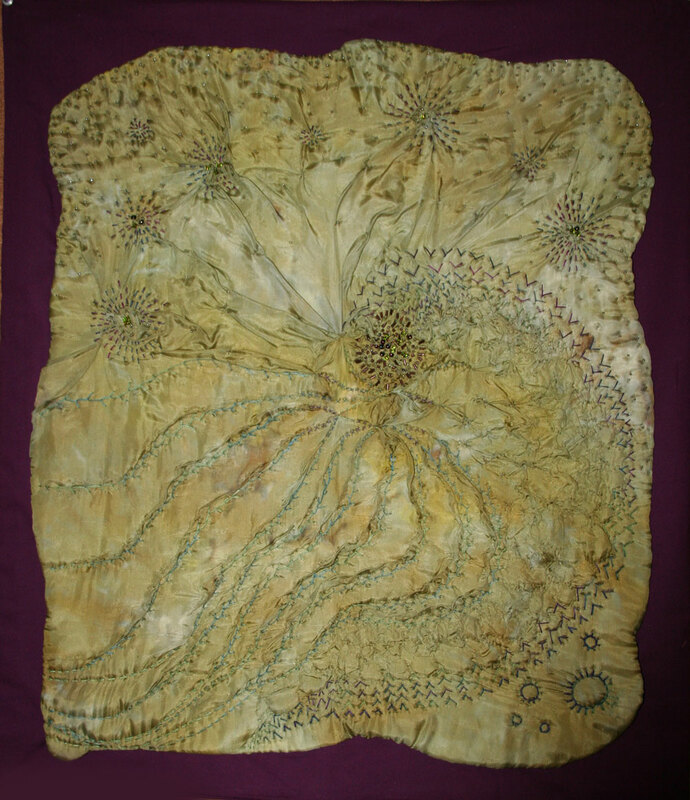 See this piece, three others of mine, and many other fine works by my Art Quilt Group at the June 2016 Art Hop at Ninth Wave Studio in Kalamazoo. June 3, 2016 5pm-8pm.